I grew up in Central Massachusetts and was born into a family of engineers, botanists, and chemists who also explored their creative talents. I was especially inspired by my father, an engineer and painter. In college, I studied marine studies, but found myself divided between following my scientific and artistic interests. For many years, I had simultaneous careers as an environmental scientist, silversmith and jewelry designer. Currently, I am teaching children and adult classes through Wellesley College Botanic Gardens Program and am a member of the Wellesley Society of Artists. Though primarily self-taught, I have completed studio classes at several art colleges in the Boston area. My paintings have been exhibited in many shows and my works are held in numerous private collections around the United States, Canada, Australia and Austria. My adventurous spirit and love for travel around the globe provide inspiration for my paintings. A hallmark of my work is my fascination with color. Some of my paintings are carefully conceived, while others are more spontaneous, but the common thread to all of my work is a bold exploration of various color schemes and the ability to push color past traditional limits. 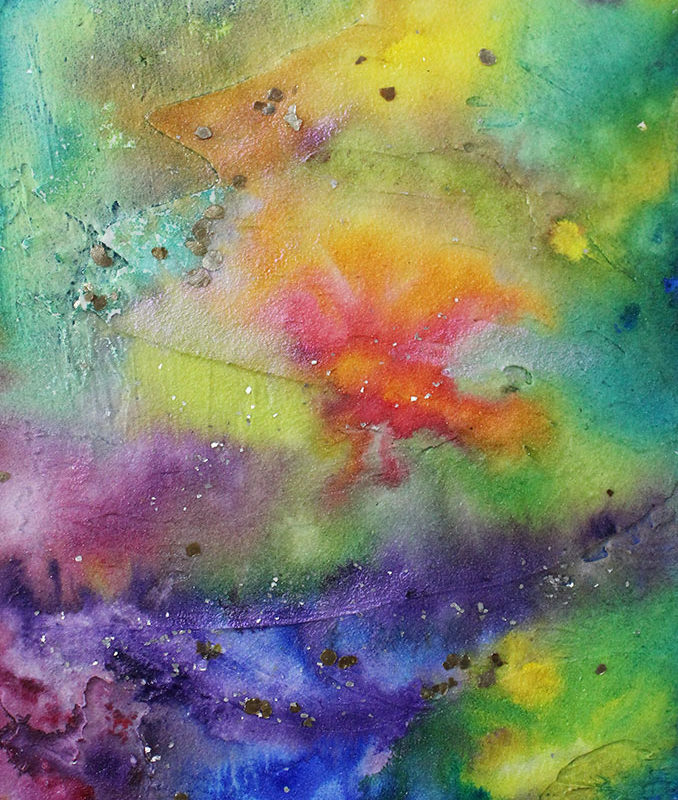 I primarily work with acrylic paints and mediums. 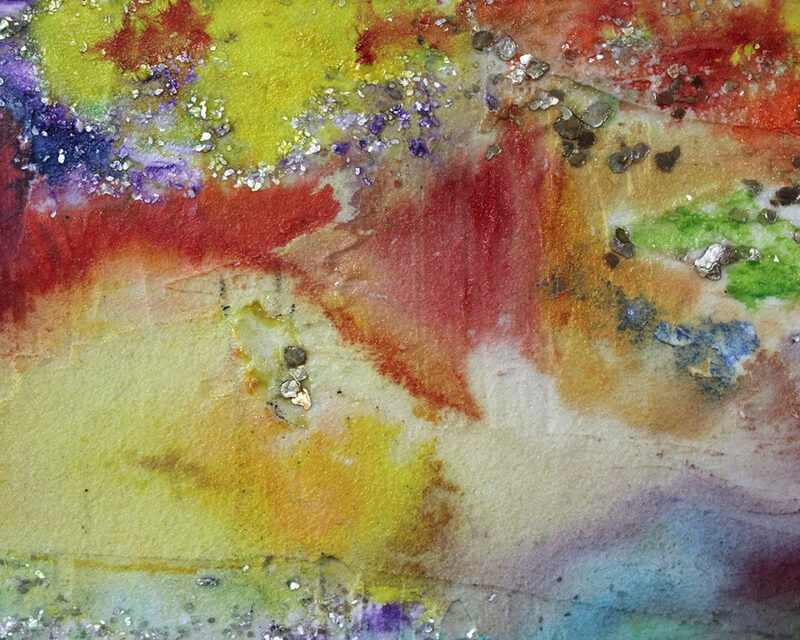 I love the versatility of this medium and enjoy creating mixed media pieces where I can explore not only color but texture, layering, and building up a surface. I am continuously looking for a challenge, trying new materials and techniques. I emerge myself into the process and just go for it to see where it leads me. For me, it is much more about the process than concentrating too heavily on the final outcome. “Hi, my name is Lynda. I’m a painter, a teacher, and a former jewelry designer. And for these particular pieces I’m very inspired by outer space, supernovas, stars being born and basically turning into red dwarfs and dying, and looking at NASA photos. So, this is a mixed media piece using acrylic. You lay down the gel medium and then you let it dry overnight. And then you basically put the acrylic paint on so it appears to be like watercolor, which I think is very interesting because I love watercolor and I love painting on canvas. So, I thought, ‘How can I marry these two mediums together’ and then I found this particular medium and it just works perfectly. You can see here it looks very much like watercolor. 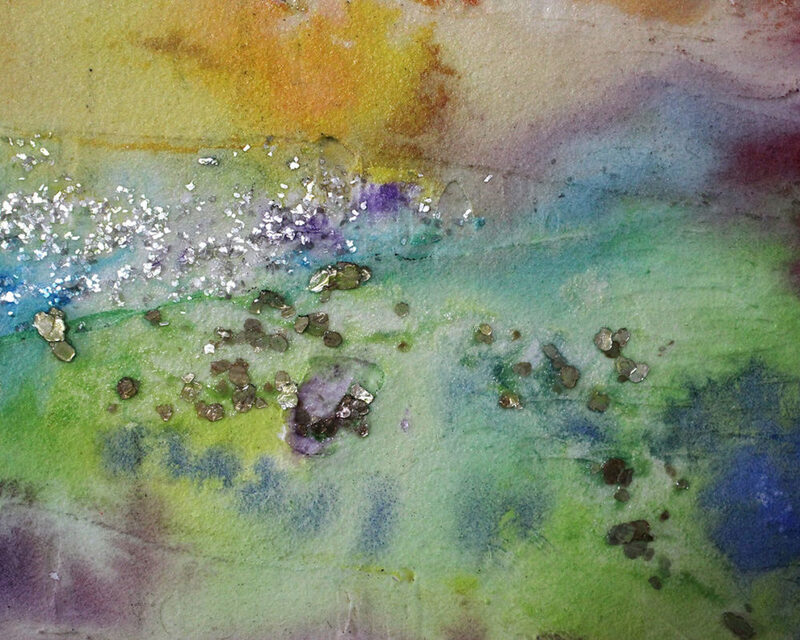 You probably wouldn’t think this was necessarily acrylic, but I think it’s very interesting, and I also added some mica. Maybe from my jewelry experience because I needed a little bit of bling, a little bit of sparkle. Maybe some stars or some space junk in there. I work very spontaneously. I don’t really say ‘Okay, here’s a picture or here’s a photo, I’m going to copy the tree and render it exactly the way the tree looks.’ I really like to have the feeling of the tree, the feeling of walking in the woods or looking at the clouds. Then I come back to the studio, and it might not look anything like I’ve observed in nature or the feeling that I had in nature, but it’s kind of just the feeling that has invoked in me from experiencing a certain event in my life or beautiful scenery. Then I use many different mediums. 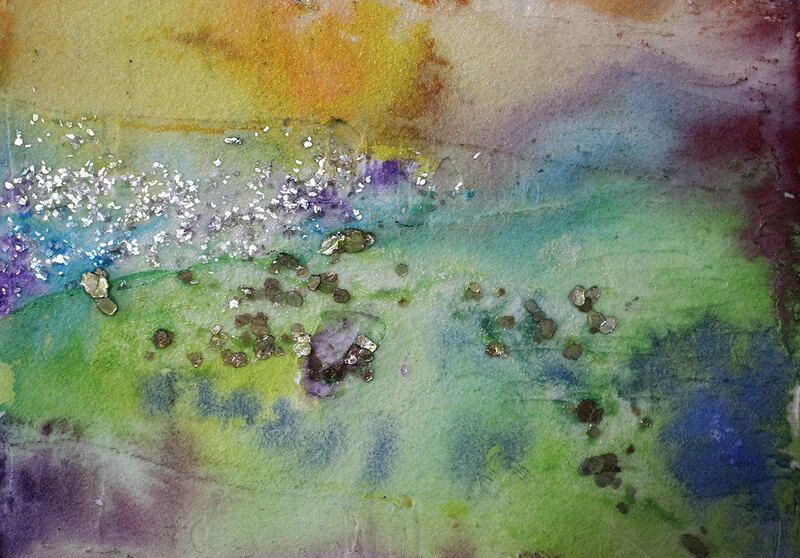 I use primarily acrylic and I could put some collage materials in– some magazine pieces or some pieces of metal. You keep layering and layering and you get a lot of texture, so I really love exploring color, texture, and just kind of doing it and seeing what happens. If you don’t like it, you can gesso over a certain part of the painting you don’t like, and then you can go back and do it again. So, it’s really up to the eye of the viewer to really say, ‘What does this piece mean to me? What feeling does it evoke? The shapes, the colors, the design, the texture.’ And that’s kind of what I really enjoy doing and exploring in art with paint. Prof Lieu: I think what’s so fascinating about your work is how deeply invested you are in your media. Because I think my problem with mixed media is that a lot of times people have multiple media and they put it in the same piece, but it’s almost like they isolate the media into one part. Like this is a collage part, this is the painting part, this is the drawing part. What I love about your work is that none of that is evident. It’s like all the media that you put in your paintings all flow seamlessly into each other. 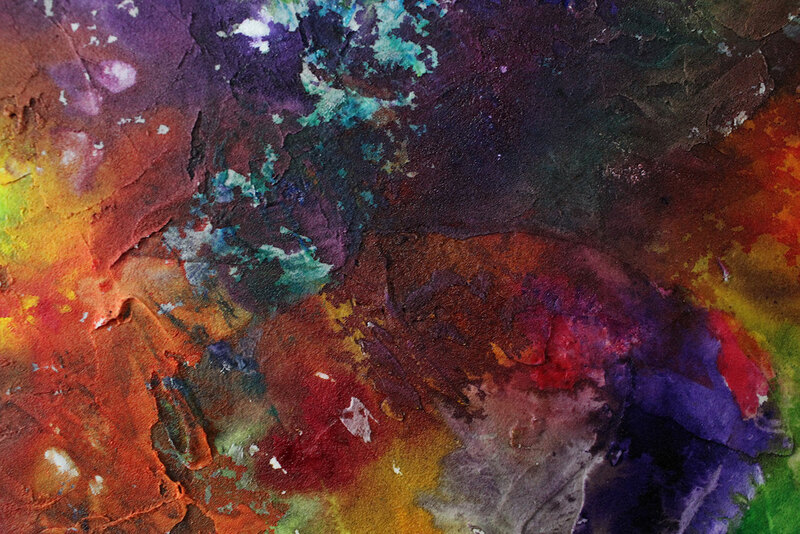 So, for example, when I look at this piece, the way you go from this watery, bright intense red and then merge into this kind of muted purple, you have an incredible range of different kinds of textures. I love this area here, because this almost makes me think about in the New York City subway when you have the paint peeling on the side and you can see the layers of paint. This almost feels like those paint chips falling off the wall, so there’s kind of this texture to it. But then you also have areas like in this one here, and also here, where things just lead into each other. There’s this real kind of beautiful flow that occurs. So, it’s incredible to me that you could have something like this, which is so graphic and gritty in a way, but also combine something that’s so smooth and fluid and so full of movement within the same piece, yet have it all kind of balance out in the end. I think that’s really, really tough to do. Lynda: I was sort of wondering about that. Does it look like two separate paintings? Or does it kind of work together? I really like that area there, because it’s more so like the painting peeling, but then there’s an interesting effect there. Prof Lieu: I think the thing that you’re doing here is that even though the shape is very different, the colors are very similar and so the colors kind of weave it together. This is a very deep warm red and you have this orange that’s just a little bit lighter. So, because the colors are similar, it allows them marks to weave together and so there are some really nice decisions. These pieces feel so emotional to me, which I think is unusual because sometimes when I look at abstract work, I feel like I have a tendency to look at just the visual. I just get enthralled by the marks and the colors and things like that. But there really is such a passion– passion for color especially. I mean, I know you love color. I think it’s pretty obvious, looking at these pieces, that that’s definitely a part of your identity as an artist. You’re somebody who embraces color so, so much. I’m wondering about the surface that you put on. Was it gel medium that you kind of scraped onto the surface of the canvas first? Or was it something else? Lynda: Yeah, it’s almost like a frosting consistency and you just put it all over the canvas. 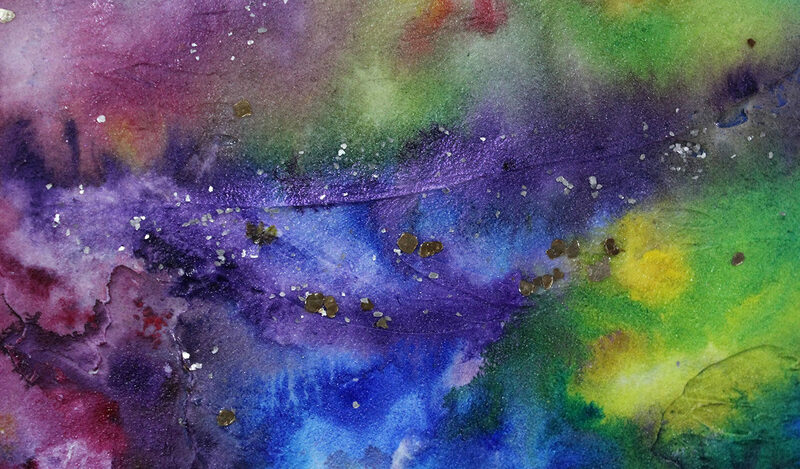 Then, when you let it dry, it lets the paint react as if it’s watercolor, so I use acrylic. Prof Lieu: Oh, so this is acrylic? I thought it was watercolor. Lynda: It’s kind of interesting because I love to paint on canvas and I love watercolor, so how do I marry those two really different mediums. So, you just apply that medium and let it dry overnight, and then you mist it with water and you wet the brush with the paint. It kind of moves like it would as if you’re putting watercolor on paper. That area is very looks very watercolor-ish. This area maybe looks a little bit more acrylic. And I like that it gives a little bit of texture. 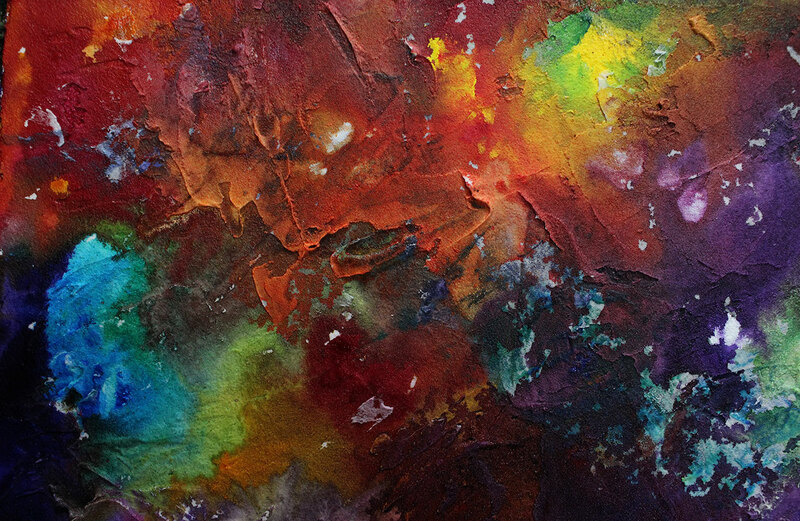 The texture within the color, but also texture on the canvas. Prof Lieu: Oh, absolutely. When I get really close, this is very three-dimensional actually. This area really just pops out as a surface. I’m kind of surprised that it’s gel medium because I feel like a lot of gel medium I see has this sheen to it. I think what I like about your pieces is that they are kind of matte, and so it does absorb the color in a very different way. I think sometimes that sheen is a big distraction, it’s too glitzy. And so that’s one thing I like here. I think one thing you could consider, if this is something you want to keep working with, is getting even more sculptural with the gel medium. I look at this area and I just am craving for more, because this becomes an object almost. Here, you’re still very much a painter. Yes, it is textured, yes, there is color, but you’re not really getting into the three dimensionality of it. I wish that this was like a half inch off the canvas, and that it almost became like a relief painting. I don’t know if you thought about maybe quadrupling the quantity of the gel medium and really sculpting with it. You can do that with a brush, a palette knife, or a scraper tool, or something like that. Is this mica? If you built up mountains of gel media that were more sculptural, think about what the mica could do. These could almost be like embedded jewels within the mountains of the matte medium, and then that would be extraordinary to look at. Now, another thing I’m noticing is that your canvases are pretty wide. If I take this piece off of the surface and I show the bottom of it, you can see this is a pretty wide canvas. Some paintings are not like that, some paintings are on a very thin canvas depending on the width of the stretcher. I’m noticing that you’ve painted all four sides of it purple. What I see a lot is that people just paint the front and then they just leave the side blank so it’s just white, and I think that’s pretty typical. But I’m noticing that you made it purple. The thing is now I wish this went over to the side, so that all this work with the mica went all around the side, and then it becomes an object. Then it’s not a painting anymore, and that makes perfect sense to me because look at how thick this is. This is a very tall painting, I almost see this much more as an object. Then, if you’re going in the more sculptural direction and the sides become more sculptural, then it’s almost like your paintings are entering a different realm in that way. So, I think that’s definitely a direction that you could push yourself in. Lynda: One thing I struggle with is when do I know a piece is done. Because if I wanted, I could add more medium on top, I could add some gesso if I don’t like an area. Then you can keep going and going and going. Sometimes I’ve done that and I’ve really ruined some parts, like if I covered that piece I’d be really bummed. Sometimes it’s hard to know: when am I done? Prof Lieu: Yeah, it’s the ongoing dilemma for every artist. I think especially when you paint, you really can always add more. I always feel like printmakers have it ‘easy’ because once you pull it off the press– although sure, you could rework the plate– there is that finale moment where is off the press and you’re done. But with this, you can always do more. So, what I recommend to a lot of artists is to take the painting and put it somewhere where you can’t see it for two weeks. This is my two week rule. Because often times when we’re in the middle of working on this, your head is so in the painting that you can’t see it objectively. So, what I’ll do is I’ll put it somewhere and hide it where I can’t see it, then two weeks later I bring it out and then it’s almost like you’re looking at the painting with a new pair of eyes. Sometimes I look at the work and I think, ‘Oh, what was I thinking? This is awful,’ and then you see things. And sometimes it’s like, ‘Hey, that’s pretty good. I think I’m gonna keep that.’ And sometimes when I’ve been working on it and thought, ‘Oh, this is the end, forget it. This is crap, I’m just going to get rid of the painting,’ then because I waited two weeks, I realized it’s not worth scrapping and I really should stick with it. I think other times for me, to be honest, I’m just sick of it and I just say, ‘You know what, I’m done. I don’t care where it is, let’s just leave it alone.’ Or you just feel like the painting has run its course. The other thing that I’ve noticed too is sometimes when I’m working on a piece, I start picking. What I mean by that is I’m working on the piece, but the changes I’m making are really minor. I’ll go in and I’ll do a little here, a little there. And for me, the most exciting part of the process is when I’m pushing this and pushing that (big sweeping motions), I can splash red, and push that– that’s when I know I’m really working on the piece. And I don’t when I start fussing and picking. The quintessential problem I see with art students is that they’re afraid they’re going to ruin something, to the point that they under work their pieces. You don’t have that problem because this piece is so rich and so full and vibrant. There’s no part of this painting that I would say wasn’t worked on or wasn’t considered, so that’s not an issue for you. I think the other thing is you also have to be okay with maybe losing a painting here and there. But, with the idea that some of them might really be spectacular, and you have to make some bad pieces. I think about all the work I do, and most of it doesn’t get shown. Actually, probably only thirty percent of it makes it, and the other percentage doesn’t go anywhere. But I learned from those pieces and it made that thirty percent better. But with some, it’s so spontaneous and it just comes out perfect. But very few and far between. I think when people have these really high expectations– that every piece they do has to be great– you’re going to be really frustrated. Because I don’t care who you are, even the great artists of our time like Michelangelo and Rembrandt, if you go through all their sketches and everything, they have some sketches that aren’t that amazing. You’d think, ‘Oh, that’s really insulting, it’s Michelangelo. She’s saying he didn’t have a good drawing,’ but we all did that, we all made drawings that weren’t great. You seem like somebody who’s so willing to accept that, which is fantastic because a lot of artists aren’t into that. They want everything to be a success. 6 responses on "Lynda Davis Jeha"
Hello! I absolutely love how vibrant and colorful your pieces are! It was very interesting to hear about the process of creating your pieces. I agree with Prof Lieu that it was be interesting to add more volume to your pieces by building up the gel medium; it would be like you are building your own supernovas! Although your pieces already have incredible depth to them, I think that building up with the gel medium more in certain places can really activate the depth of future pieces even more. I wonder if maybe you could create a series of these pieces with different color schemes based upon different experiences and the feelings from them. I thought it was interesting how you stated you often create art based upon a feeling after an experience, and it would be interesting to see specific feelings translated in a way similar to the pieces you have here. I find your fearlessness when exploring media and color so admirable! That is definitely something I strive for in my own work. I get lost in this piece and feel like I could spend hours in front of this in person (and I would definitely have a difficult time refraining from reaching out and touching it if it were in a museum!). Going forward, I would recommend really thinking critically about value. You rely heavily on the contrast of colors to create shapes and variations in your piece, which creates a beautiful richness that I love, but I think that the composition could be enhanced by being even more deliberate with change in value. There are moments where you do this very successfully with pockets of light, sheer paint in the midst of lush, dark and sculptural areas. Those are my favorite moments in your paintings! Overall, great job! I love how passionate you are about exploring the possibilities of paint! These pieces are overwhelmingly vibrant, in the best sense! 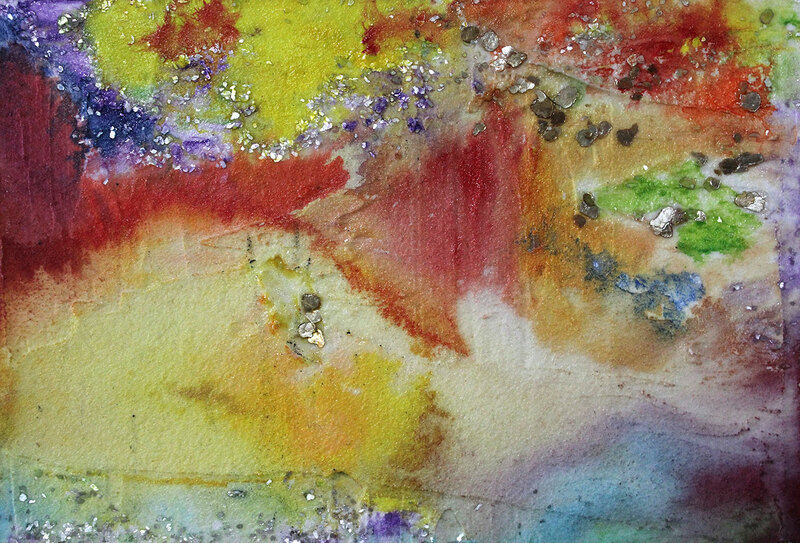 The way the borders between the colors ebb and flow on top of the frosty texture of the gel medium really make me want to pick up the paintings and touch their surfaces. It was also quite exciting to hear how much you experiment in your process! I think I’d like to hear a little bit more about the presentation of this piece. With this triptych setup, I think the thinner paintings on the side are made to look inferior to the middle piece, almost like two servants on either side of a queen. If they were hung separately, I think each would get the attention they deserved, and almost make it feel like the viewer were looking through a tiny window into this cosmic landscape. That’s just a minor detail, though. Great job! I’m really vibing off of your love of color and mediums, it’s really oozing off the canvas! Especially as a chromophile myself, I appreciate that I’m able to visually follow your process making these paintings. The layers are really visible, which is sometimes difficult to show with acrylic. 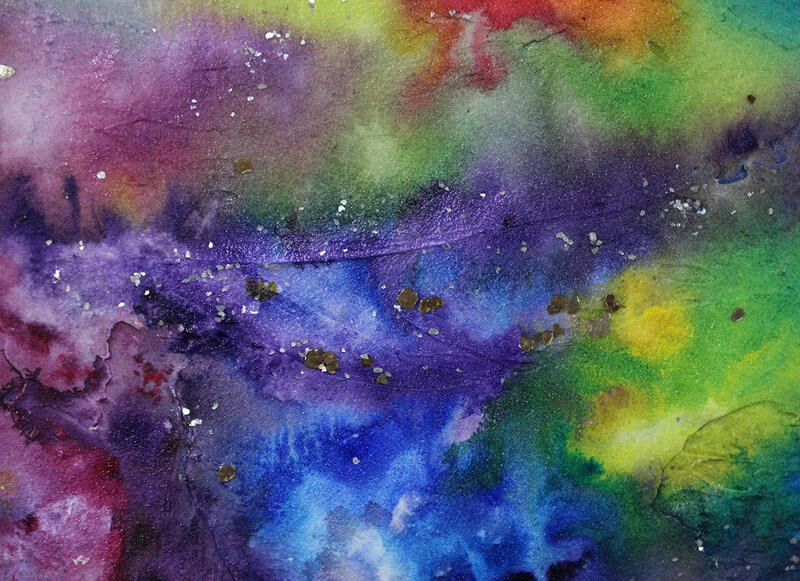 Your work reminds me a lot of Lauren Olitski and Dianna Vosburg. That being said, I think I’m looking for a bit more intention or explanation in your visual decisions. Why are you working on such a small scale for such an enormously spacious subject? Why are you using 100% saturation across the whole piece? Why did you apply the moulding paste in the way that you did? When you love everything about paint and are really caught up in the joy of that alchemy (because your paintings are alchemy! ), it’s easy to fall into magpie syndrome where you want to have a little bit of everything, especially the flashy things, but they don’t necessarily have a driving purpose in the painting. Personally, I think being a magpie is fine when you’re experimenting, and you just want to learn how stuff works, but I would also pay close attention to how you’re putting these visual and material effects together and why. When everything is a loud and awesome effect, all these visual moves you’ve made fight for attention and drown each other out. For instance, getting your mica to really sing might mean dulling the tone and saturation of some of the colors behind it, or brushing on a matte medium to create a contrast in luster. I think you have a lot of skills, versatility, and passion really going for you in these paintings, so when that organization comes into play, you’ll be golden! I just learned about a method of priming paper that I think you’d really get a lot of good results from! If you get some nice thick arches watercolor paper, (or bristol board – different results for each) and soak the page, then add drops of different colored waterproof ink onto the wet paper. once this is done, lay the paper between two boards and add weight…I mean, a lot of weight! The local Colorado artist who taught me this trick said he would sometimes drive his car over the board to really get some good pressure onto the paper. Anyway, when the process is done you have a phenomenal cosmic quality to the page, and that’s just the start! You can then work on top of this wonderful process, and add some more depth to the image! I can really imagine your work done on paper primed this way, and it would be a great way to add a great sense of depth. 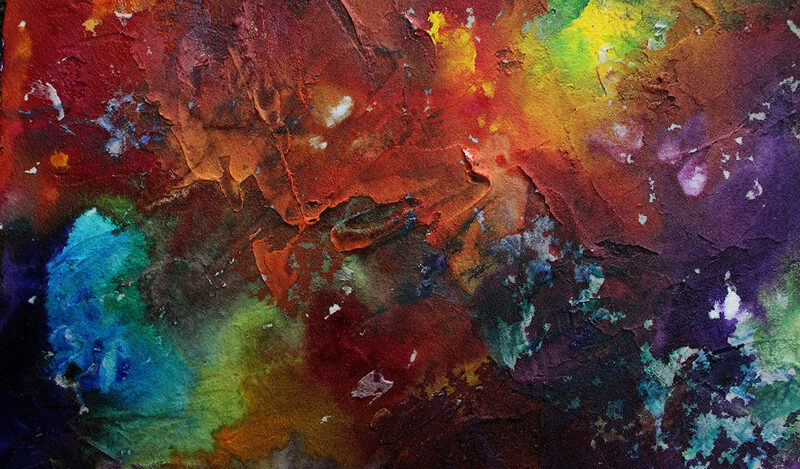 I love how lush and vibrant these paintings are – I only wish I could see them in person! You’ve given us so much to sink our teeth into, between the rich colors and textures, the pieces of mica, the application of the paint and the way it all blends together….It’s clear you’ve done your due diligence experimenting with all of the materials you’ve mixed together, and that really pays off with a final product that feels cohesive but exciting. The only thing I can think to suggest is that you take this work to a larger scale next time; especially considering your cosmic inspiration, I want to see one of these pieces on a huge canvas!